This dramatic two-seater is the all-new Mazda MX-5 sports car, the fourth generation of roadster over the past 25 years to wear the iconic badge. 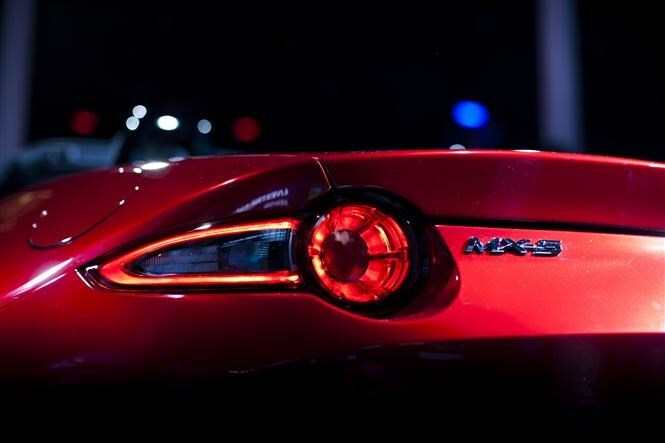 What's new about the Mazda MX-5? Mazda's first three generations of MX-5 have been evolutionary in their styling metamorphosis but this fourth iteration is a bold new take on the successful formula which has seen it become the best-selling two-seater sports car of all time. Now featuring an aggressive version of Mazda's trademark deep-set, five-sided grille, leading back to scalloped out headlights, the family link to the 3, 6 and CX-5 is clear, although with more purpose and flamboyance to the 'Kodo' design language. More daring is the wholesale refreshing of the rear end, with curvier haunches and tail lights with a hint of Jaguar F-Type about them. 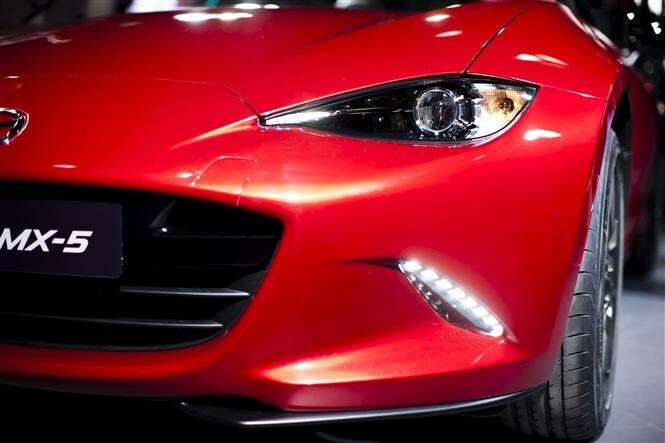 Also new is that the latest MX-5 isn't all Mazda's own work, but instead is a joint venture with Fiat. The Italian brand will unveil its version of the two-seater roadster in the next few months, with unique bodywork but many shared components underneath the skin. Both versions will be manufactured in Japan. As before, the new MX-5 remains rear-wheel drive, promising the kind of affordable fun handling that has kept enthusiastic buyers returning to the Mazda fold year after year. Like other models in the Mazda line-up, the latest engines, as well as the MX-5's underpinnings, have undergone the SkyActiv treatment, meaning lighter weight (over 100kg has been shaved off the outgoing model) and greater efficiency for reduced fuel consumption and better overall performance. 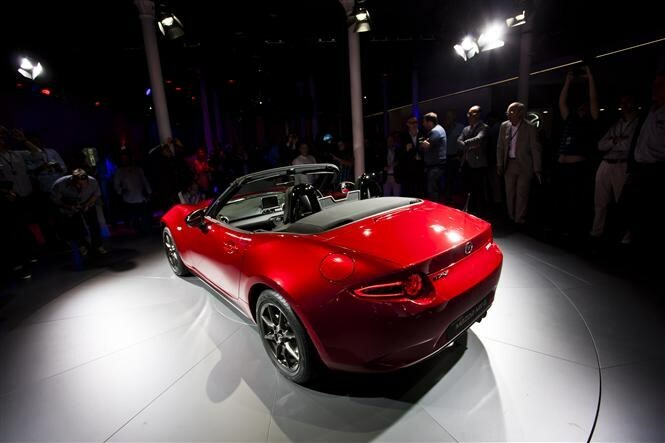 From launch, the new MX-5 will be offered with a choice of SkyActiv-G petrol engines, although precise performance and economy figures will be revealed later in 2014, Mazda is confident all will be superior to those of the outgoing model. Currently Mazda is tight-lipped about transmission options but with rivals offering automatic options alongside standard manual gearboxes, a self-shifting MX-5 could be on the way to the UK for the first time. Mazda promises that the weight-saving measures and greater performance will amplify what keen drivers love about the MX-5, something we'll be keen to scrutinise when Parkers is among the first to road test the all-new version in the coming weeks. 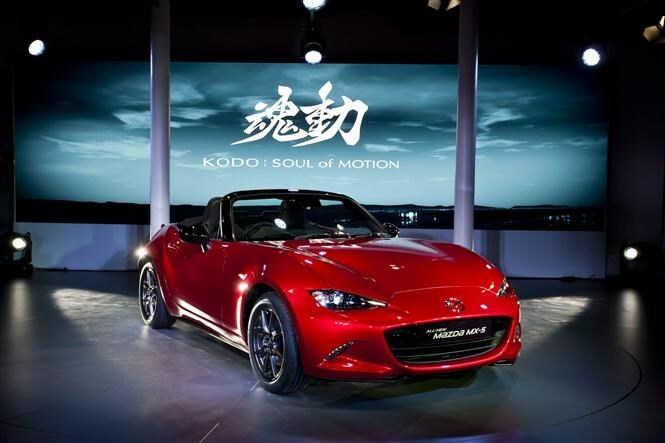 During the last model's life-cycle, Mazda introduced the MX-5 Roadster-Coupe with an electrically-folding two-piece hardtop selling alongside the traditional fabric-roofed roadster, accounting for 80 percent of UK sales. While the new model has been unveiled with a soft top, the folding metal roof is likely to be part of the range once more. Although part of Mazda's ethos with the MX-5 was the car's simplicity, the latest version has had to move on with customer demands and expectations. 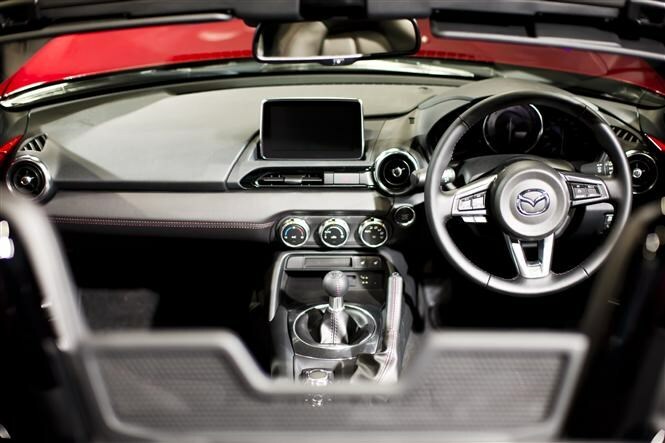 Inside, the latest MX-5's bolder cabin features the latest version of Mazda's MZD Connect system, with other contemporary features bringing the roadster right up to date. British sales begin in the second half of 2015; come back before then for the full Parkers Mazda MX-5 review and find out if the new model continues the brand's enviable reputation for affordable, fun sports cars. To read our full review of the current Mazda MX-5 click here.